Sergio Vieira de Mello was singular in the humanitarian aid world for being at the same time more handsome, well-spoken, charming, and accomplished than any of his contemporaries. He was also intrepid, swooshing in ahead of others in his own emergency agency into post-conflict war zones. 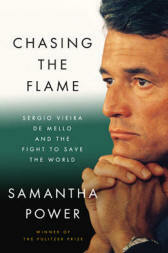 Samantha Power’s best-selling biography of Vieira de Mello engagingly, inspiringly and edifyingly surveys his whole life, chronologically, beginning with an emphasis on Vieira de Mello’s passion for philosophy (while studying at the Sorbonne in Frances) and radical politics. As seems to be more and more common with best-sellers, the books subtitle over-states its topic. The book does not survey efforts to save everyone in the world, nor does it survey many organizations or individuals. Rather, it closely tracks the experiences of one individual and primarily with one agency. Powers describes Vieira de Mello’s youth spread out in Brazil, Italy and other countries, as the son of a Brazilian diplomat, an experience that gave Vieira de Mello excellent language skills at an early age, which he parlayed into his first job, at the United Nations High Commissioner for Refugees (UNHCR), during a pivotal period when UNHCR began shifting from a narrow focus on Europe to a world-wide aid agency. Vieira de Mello’s first assignment was the delivery of food aid to returning Bangladeshi refugees after the 1971 war over Bangladesh’s independence. In the course of depicting events in a few key crises, Powers explains clashes between humanitarian and political approaches to problems, such as when Annan and the U.N. opposed the US bombing of Serbia in 1999. Powers gives much of her text over to periods of his life when Vieira de Mello was more of a political figure than a problem solver of aid operations. Interestingly, Vieira de Mello is one of the view individuals in history to have been, to some degree, the sovereign ruler of multiple countries. He was the UN-appointed Special Representative to Administer Kosovo (1999), as well as in East Timor (1999 – 2002), where he became friends with Xanana Gusmao, the eventual President. Despite UNHCR’s role in managing technical operations in many sectors, Powers mostly remains interested in capturing in personalities and politics, mentioning hundreds of aid colleagues who worked alongside Vieira de Mello at different times, or peacekeepers or military officers who negotiated with him. Where Powers describes aid operations, she focuses on protection and security primarily, or on positions of authority, so the book does little to enlighten about lessons in what actually works in hunger, health, shelter, or other aid programs. Her vignettes involve numerous road-blocks, impasses, and bridles-rivers, but next to nothing about the work being sponsored by the UN, or about the affected populations. Much of Vieira de Mello’s career tracked the expansion of UNHCR itself and, later, appointments that reflected how much then Secretary General Kofi Annan (himself formerly with UNHCR) depended on him. As Powers describes it, Vieira de Mello accepted the thankless assignment in Iraq in 2003 for the “prosaic reason: the Secretary General of the United Nations had asked him.” Powers devotes 100 pages to the few months that Vieira de Mello was in Iraq, as well as the aftermath of the bombing and its repercussions on his family and friends. Indeed, his diplomacy and accessibility is one of many reasons that Vieira de Mello was widely believed to be a sure-bet to someday be Secretary General of the United Nations. As Powers sets things up in the first chapter, Vieira de Mello’s anxiety was interlaced with his own deep philosophical views about justice, respect, fairness and a field-level sense of priorities. Above all, the telling of Vieira de Mello’s life is an important demonstration of a life well spent. Working diligently and sincerely within a multilateral system, Vieira de Mello exemplified nobility in the cause of humanitarian aid. Steven Hansch is a member of the board of the World Hunger Education Service, serves on several other non-profit boards, teaches about humanitarian aid at several universities, and has worked overseas conducting nutrition and public health programs, primarily in emergencies.